Last week I decided that it might make more sense to start another blog to chronicle my quilting journey. That way I could tailor it to be more specific to quilting: the blogs that I follow, the giveaways that I share, that sort of thing. Plus, I wouldn't be boring my non-sewing friends with all of my quilting angst. I spent two days deciding on a new blog name, finding a template that I liked, installing it, customizing it, cussing over the code, setting up pages, and designing buttons for it. Then another day flew by while I uploaded blogs to follow, and copied over old posts from this blog about quilting (so that there would be a history). 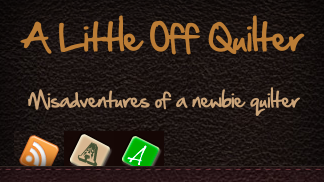 Work still needs to be done but it's close enough, so today A Little Off Quilter goes live. From now on you won't be seeing any sewing or quilting posts on this blog, except for project finishes. So if you're a quilter or into sewing and would like to keep up with my misadventures in those areas, you're welcome to follow my new blog. Old friends are always welcome! ooooh can't wait to see whatcha make next!! You are too cute for words~ I LOVE the name!!! Glad that you are enjoying quilting...Someday I will follow in your footsteps,like always~ LOL! Now that is the most inventive name, love it!! you have more imagination that I do for this kind of thing.